This may be my favorite at-home mani yet! It's so easy to do, and personally, I think it looks so chic. Best of all, it's incredibly easy to touch up (for those of you who chip your nails as often as I do) and you don't have to worry about applying the polish in perfectly even strokes. At first I was only going to apply 2 coats of gold glitter polish and call it a day. I then decided to add one coat of "Set in Stones" by Essie, and absolutely loved the end result. 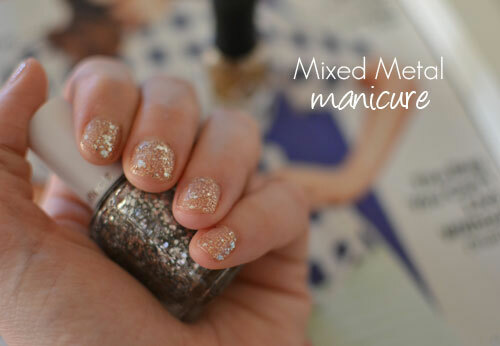 So the next time you only have about 5 minutes to do your nails, I highly recommend trying this combo! P.S. 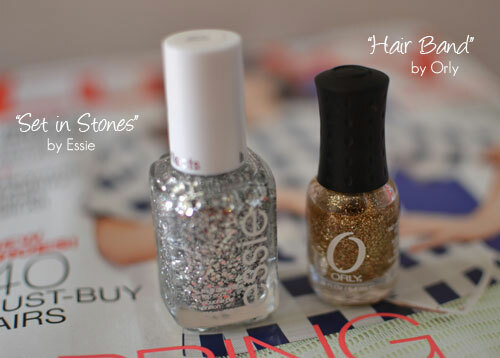 - I absolutely love Essie's "Set in Stones" top coat. It's such a fun way to liven up just about any nail polish color.